If your event or operational expense occurs before April 27, you must submit your REQ form by this deadline. If your event or operational expense occurs on or after April 27, you can still submit a REQ form after this deadline, however, please submit REQs as soon as possible. Any REQs that do not meet the deadline may take up to 8-10 weeks to be processed. USAC Surplus Fund 2017-2018 now accepting applications! Proposals should be typed and submitted to the USAC Surplus Fund Google Form by February 13th at 11:59PM. All line items must be accompanied with line item breakdowns, expected attendance, agendas, and estimates (i.e. invoices and/or quotes). Please refer to Article VI.C.4.a-e of the USAC Bylaws and the USA Financial Guidelines for a complete description of minimum criteria. All allocations will be made on a viewpoint neutral basis, and attendance or participation in all programs or projects funded by the USAC Surplus Fund must be free for all members of the Undergraduate Students Association. Eligibility: To qualify for the USAC Surplus Fund, you must be an undergraduate student associated with a registered campus organization. Contact Student Government Services: sgs@asucla.ucla.edu for more information. Upon completion, applicants will be instructed to sign up for a USAC Surplus Fund Hearing to discuss their application with the Council. Each application will be allocated 10 minutes; 5 minutes will be allotted for presentation followed by 5 minutes for Q&A. Applications will be DUE on Friday, March 17th by 5pm. You must submit a printed copy to the USA President's Office (KH317) as well as an electronic copy to osac@asucla.ucla.edu. This year is a reallocation year for OSAC, so student organizations that currently have offices, lockers, and/or mailboxes in Kerckhoff Hall will need to REAPPLY. If you have any questions, feel free to contact the committee at osac@asucla.ucla.edu. Need funding for your next green project? Turn to The Green Initiative Fund (TGIF) to help pay for your environmental projects. 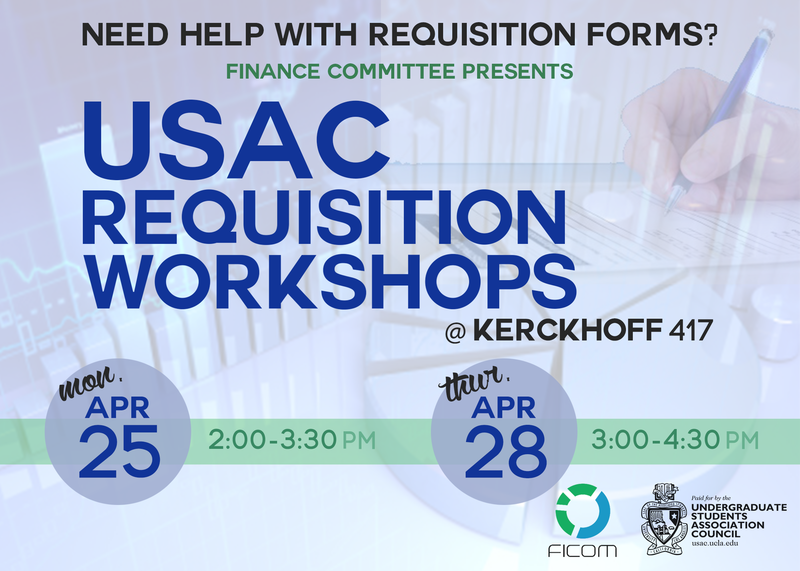 The Finance Committee is hosting two workshops during Week 5 to answer any questions about requisition forms! The deadline for all reqs is April 29, 2016 by 4 PM. The Finance Committee will be present at these workshops to give one-on-one assistance with reqs, and will be available during set periods of the workshops to sign off on forms. We hope to see you there! The application period for Capital Contingency for student groups has passed. The fund will reopen in the Winter. https://www.usacfunds.ucla.edu/fundapp/capital-contingency/ for more details. On February 5th, 2016 (Friday, Week 5), the Finance Committee will be closing all Contingency Programming accounts whose event dates ranged from November 1 to December 31, 2015. Please submit all requisitions if you have not already as soon as possible to the Student Government Accounting office (KH 332). All funds that have not been claimed by February 5 will be returned to the Contingency Programming fund to be re-allocated to future events. No exceptions will be made for any student organization/USAC office/commission. If you have any questions or concerns, please feel free to email us atusaficom@asucla.ucla.edu or drop by during our office hours (KH 300B) where we can assist you in-person. Thank you for your cooperation! Next week the USA Council Meeting will begin at 6pm. We hope that you all will attend and then join us at the Bonfire. Thank you. The USAC Office of the Internal Vice President has a fellowship available to all incoming students who are interested in becoming involved in the UCLA student government, known as the Undergraduate Student Association Council (USAC). The USAC Office of the Internal Vice President is excited to share with you the opportunity to join the IVPhamily! The IVP Fellowship is a comprehensive program designed for new high achieving, spirited, determined, and of course FUN Bruins! The IVP Fellowship is perfect for Bruins with a deep passion for making an impact throughout UCLA! Finance Committee Alternate Member application now open! Are you interested in finance? APPLY TO THE USAC Finance Committee Alternate Member Position!! The Finance Committee is responsible for handling all financial matters of USAC. This includes receiving, analyzing, and reviewing all budgets and financial requests dealing with USA funds, specifically examining requests from the USA Contingency Fund and Capital Fund. The committee ensures that funds are spent appropriately in accordance with USAC and University Financial policies. Want learn more about committee member expectations? Check out the application below. PLEASE NOTE: Applicants must be FIRST YEAR (including first year transfer students) OR SECOND YEAR UCLA STUDENTS. Applications must be submitted by midnight on Monday, October 5, 2015. We have launched a new funding web application called USAC Funding. USAC Funding will replace the studentfund.asucla.ucla.edu SharePoint® website. We have streamlined the process by removing a few problematic steps during the application process and added additional tools for fund directors to generate reports. CS-Mini, SOOF, and USA-ASUCLA BOD can be found on the USAC Funding new website. We have also added Contingency to USAC Funding. Bruins, grab a seat at the forefront of change and apply to be a part of your student government! USAC stands for the Undergraduate Students Association Council, which is the officially recognized student voice of undergraduate students at UCLA to the campus administration, faculty, and outside community. It is comprised of thirteen offices and commissions and aims to serve the UCLA community through advocacy, education, and programming. There is a place for every student to be part of USAC. We can all work together to make UCLA the best it can be!? Election Board -- Submit Questions! Election Board wants to remind you that you are welcome to submit questions, that you would like for us to ask during the Candidate Debates, on our website. You can go to www.usacelectionboard.com/debates and submit questions from now until April 23 at 8:00pm. Please note that Election Board will determine whether they are appropriate and, as a result, your question(s) may or may not be used. Candidate Debates will be hosted at Carnesale Palisades, Sunday April 26 from 7:00pm-10:00pm. We hope to see you there! Applications will be DUE on WEDNESDAY, APRIL 15th by 5pm. You must submit a printed copy to the USA President's Office (KH317) as well as an electronic copy to osac@asucla.ucla.edu. Need funding for your next service project? Turn to Community Service Mini Fund to help pay for your projects. CS Mini Fund Application Deadline The Application deadline is Friday, January 30th, by 5pm. Apply online at "http://students.asucla.ucla.edu/funding/programming.php. 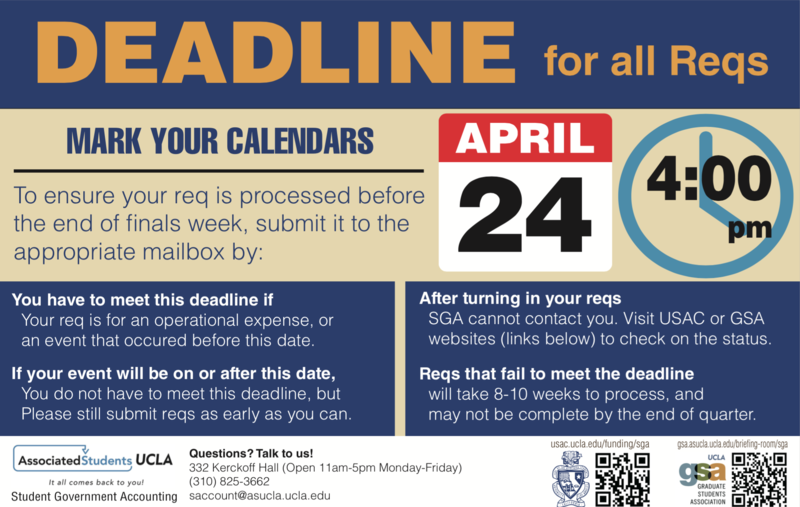 If you would like to contact VITA (Volunteer Income Tax Assistance) at UCLA, please email vitaucla@gmail.com. USAC Internal Vice President applications are due Friday, November 21, at 11:59PM. Interviews will be held over the weekend. The application can be found here. TGIF Application Deadline The Green Initiative Fund Application deadline is Friday, April 25, by 5pm. Please email final applications and direct all questions to TGIF@asucla.ucla.edu. Are you involved in community service? Are you a student leader? Do you have a positive impact in your community? If you answered yes to any of these questions, then the John Hoang Sarvey Leadership in Service Award is for you! Every week, we will be showcasing a past winner of the award who reflects the same leadership, passion, and dedication for service as John Hoang Sarvey. To learn more and apply, visit www.communityservicecommission.org. Applications are due April 20th. Check out the resolution page to see upcoming resolutions and to submit your comments. USAC meeting on February 25, 2014 is moved to Ackerman Grand Ballroom at 7PM. The USAC Election Board is looking for students who are interested in helping to facilitate the 2014 USAC Elections. Positions include Investigations, Publicity, External Relations, and Endorsement Hearing. Click on this link to apply. Deadline to apply is Tuesday, February 4th at 12:00PM. Student Government Accounting is experiencing technical difficulties with our accounting software and will not be able to process any transactions until possibly Wednesday, January 22, 2014. There seems to be a problem with the software that is beyond our control. Content: Due to Winter Break closure, the Finance Committee will accept applications for events between January 1 - January 18 up until Tuesday, December 3, 2013. No applications will be accepted after this date. Due to Winter break campus closure, the Finance Committee will not convene until Tuesday, January 7, 2013. If you have any questions/concerns, please email us at usacficom@gmail.com. TGIF Application Deadline The Green Initiative Fund Application deadline is Friday, November 1st, by 5pm. Please email final applications and direct all questions to TGIF@asucla.ucla.edu. TGIF Mini Fund Application Deadline The Green Initiative Mini Fund Application deadline is Friday, October 4th, by 5pm. Please email final applications and direct all questions to TGIF@asucla.ucla.edu. The USAC Office of the President and Student Wellness Commission are working to examine sexual assault policies, improve campus safety, and strengthen crime reporting. Make an Impact! Apply to a USAC Internship! New Bruins, are you looking for amazing opportunities to create positive change on our campus and beyond? Check out the different USAC internship opportunities! Through USAC, you will have the opportunity to impact the college experience of 27,000 undergraduate Bruins and shape the future leaders of our country. The USAC Internships are an opportunity for new students to learn about USAC and join one of our 13 offices. It is important to note that the Internships are not restricted to new students. If you applied and received Summer Contingency, all requisitions must be submitted by Friday, July 26, 2013 @ 4PM. No exceptions will be made for late requisitions. Requisitions must be submitted to Mailbox #58 or Student Government Accounting Room 332 (located on the third floor of Kerckhoff). Thank you for your cooperation. USAC Staff Applications- Apply Now Online! Looking to play a crucial part in your school government? USAC staff applications for 2013-14 are now online. View the applications and deadlines at the link below. Upon hearing about the bombings at the Boston Marathon, there were many reports of runners who finished the marathon and ran straight to the hospital to donate blood to victims. In symbolic fashion, and to commemorate the victims of the bombings, we will be writing letters to victims, their families, and first responders, and leading a short route through campus ending near the UCLA Blood & Platelet Center for a blood drive. Organization space allocation applications for the following school year have been released! Please fill out an application if your student organization would like to apply for an officespace, locker, or mailbox in Kerckhoff Hall. Applications are available for download online at http://tinyurl.com/uclaosac2013. Please read over the application thoroughly for a comprehensive overview of the application process and eligibility requirements. Applications are due: Friday, April 19, 2013. Late applications will not be accepted. Contact the OSAC Chair, Noel Ople, at osac@asucla.ucla.edu for any questions or comments regarding the application process. TGIF Mini Fund Application Deadline The Green Initiative Mini Fund Application deadline is Friday, April 5th, by 5pm. Please email final applications and direct all questions to TGIF@asucla.ucla.edu. TGIF Spring Quarter Application Deadline The Green Initiative Fund Application deadline for Spring Quarter 2013 is Friday, April 19th, by 5pm. Please email final applications and direct all questions to TGIF@asucla.ucla.edu. Hearings will be held Week 4 and Week 5. Have any questions regarding the USAC elections? Visit the USAC Election Board website for the most updated news and information. TGIF Winter Quarter Application Deadline The Green Initiative Fund Application deadline for Winter Quarter 2013 is Friday, January 25th, by 5pm. Please email final applications and direct all questions to TGIF@asucla.ucla.edu. Hearings will be held Week 4 and Week 5. Just scroll down and find us! Confused about where you are living next year? Have questions about living off-campus? Don't even know where to start?! Well, look no further! The USAC Internal Vice President's Office is proud to present to you the 2013 Off-Campus Living Fair on Tuesday, January 22nd from 11am to 4pm. Come find out all you need to know about living off-campus and about all the various housing options outside UCLA. Over 40 properties will be represented. We are also raffling off gift cards, iPad minis, and much much more! Get excited because this is an event you WON'T want to miss! Can't wait to see you all there! Are you interested in finance? APPLY TO THE USAC Finance Committee Alternate Member Position!!! The Finance Committee is responsible for handling all financial matters of USAC. This includes receiving, analyzing, and reviewing all budgets and financial requests dealing with USA funds, specifically examining requests from the USA Contingency Fund and Capital Fund. The committee ensures that funds are spent appropriately in accordance with USAC and University Financial policies. Want learn more about committee member expectations? Check out the application?! PLEASE NOTE: Applicants must be FIRST YEAR UCLA STUDENTS (including first year transfer students). Would you like to learn more about funding? First off, on behalf of the Budget Review Committee, I would like to commend all student organizations and offices for providing a space for students to come together to enrich the UCLA experience with all the activities and programs your organization provided for students. We hope your organization continues to thrive and grow, and we wish your organization the best for next year. If you were allocated funds for either SOOF or SGOF this past academic year, it is mandatory that your organization fills out an evaluation online. The evaluations will be due June 30th, 2012. Failure to submit an evaluation may negatively affect your allocation for the next academic year. First off, The budget review committee would like to commend all student groups in enriching the UCLA community with all these wonderful programs you all hosted throughout the year! The USA/BOD Programming Fund Committee request that an evaluation is filled out for EACH event your organization applied for (This means you must fill out multiple evaluations if you had more then one program throughout this academic school year) . It is REQUIRED that this evaluation is completed for every event; otherwise, this may be detrimental and may negatively affect your event’s allocation for next year. Please complete this online evaluation application by June 30th, 2012. Looking to play a crucial part in your school government? USAC staff applications for 2012-13 are now online. View the applications and deadlines at the link below. Dear UCLA student groups, Due to a large volume of applications, the External Vice President's Office Travel Grant Fund will stop receiving applications for the 2011-2012 year 8th week of Spring Quarter. Thank you to all the groups that have applied to the fund this year! USAC will discuss updating the USA Student Welfare Commissioner’s title. Bruins! Interested in what your USAC Officers have been passionately working on this year? Take a look at the USAC 2011-2012 Accomplishments, compiled by the USAC President's Office! Take a look at what has been keeping USAC busy this year, and feel free to share this link with anyone interested! The USAC President's Office along with the USAC Finance Committee would like to present the FIRST EVER "Top Ten Best Kept Funding Secrets (Spring Edition)." Check out the Best Kept Funding Secrets YOUR student government has to offer!!! This newsletter will let you see a break down of some of the under-utilized SPRING funding sources' deadlines, criteria, and contact information. John A. Pérez, Speaker of the Assembly, and Assemblymember Holly J. Mitchell will be holding "Office Hours on the Middle Class Scholarship Act," an informal discussion with UCLA students on the rising cost of college. The Middle Class Scholarship Act will reduce UC fees by 2/3rds for families that make under $150,000 per year. Sponsored by the USAC External Vice President's Office. The Green Initiative Fund Application deadline for Spring Quarter 2012 is Friday, April 20th, by 5pm. Please email final applications and direct all questions to TGIF@asucla.ucla.edu. Hearings will be held April 26-28th and May 3rd-5th. ARE YOU A WRECK OVER REQs? Join the USAC Finance Committee this THURSDAY, APRIL 12, 2012 for our first annual "ARE YOU A WRECK OVER REQs?!" Funding Workshop. With a special presentation from the Student Government Account office, participants will learn the ins and outs to filling out the PERFECT requisition form. Find out about the logistical information needed to submit a successful requisition form! Please bring your quotes/estimates. We will be signing requisitions on the spot and submitting them to the Student Government Accounting office to be processed. The workshop will take place in ACKERMAN 2408 from 6pm to 8pm. Free food will be provided. Major Blast is back! 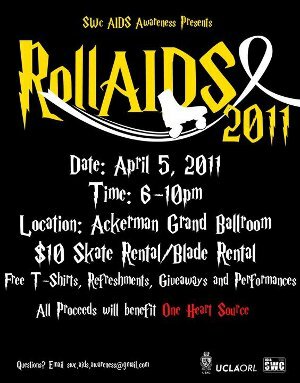 Bigger and on campus on Tuesday, April 10, 2012 from 11:30am - 2:30pm at Ackerman Grand Ballroom. This is a great opportunity for students to speak with academic advisers, counselors and/or faculty who can help them better understand majors, minors, specializations, coursework, prerequisites, workload, research opportunities, student organizations, and other general aspects of UCLA’s academic departments/schools. FREE CHUROS & TAQUITOS and the chance to WIN AN iPAD and BruinCard Cash!! We are excited that the site is back in action. Thank you all for your patience and understanding. If you notice any links that are not currently working please email our webmaster in order to fix it. Thank you again and happy spring quarter. Need a Little Funding for Sustainable Events? Check this Out…UCLA TGIF Sustainable Enhancement Mini Fund Application! The Green Initiative Mini Fund is available for sustainable projects requesting funds of $500 dollars or less. Application deadlines are the first Friday of each academic month. The next deadline is Friday, April 6th by 5pm. USAC passed Resolution Condemning Hate Crimes at UCLA and in Support of the Latina/o Community’s Demands on March 13, 2012. This resolution was sponsored by El Movimiento Estudiantil Chicana y Chicano de Aztlan (MEChA) de UCLA and Latin American Student Association (LASA). Support was shown by 26 other campus organizations. To read the resolution in full, see the link below. Be a student debater in the CA Death Penalty Debate! Should California end the death penalty? The CA death penalty is a hot topic in California politics. Experts, politicians and activists have all put forth reasons for and against this policy. It's time for UCLA students to weigh in! Amnesty International at UCLA and the USAC External Vice President's office are co-programming a debate on the death penalty in California. The debate is Try-outs will be held on Thursday, April 5th at 7pm in Kerckhoff 300C. The Contingency Capital Items Fund is now open. If you have any questions, please contact the Chair of the Finance Committee at usaficom@asucla.ucla.edu. Thank you. Do you consider yourself unbiased, fair, and a leader? Apply to become the next Election Board Chairperson here! : Presidential Appointments 2011-2012 Application (please ignore the due date!) As stated on the application, the Election Board Chairperson: Chairs the Election Board, and nominates and supervises members of the Election Board Executive Committee. Is responsible to USAC for the administration of all aspects of USAC elections. Extensive time commitment before and during regular Spring Election. The Chairperson will also oversee any Special Elections that occur during her/his tenure. The Chairperson is appointed by the USAC President for a one year term. If you are interested, please apply ASAP! Feel free to share this information with anyone else who you think may be interested, and email usacprez@gmail.com with any questions you may have. Thank you!! Need a Little Funding for Sustainable Events? Check this Out…UCLA TGIF Sustainable Enhancement Mini Fund Application! The Green Initiative Mini Fund is available for sustainable projects requesting funds of $500 dollars or less. Application deadlines are the first Friday of each academic month. The next deadline is Friday, March 2nd by 5pm. Currently, it takes 2 weeks to process your general requisition forms; if you wait until the last minute to submit your reqs to your Funding Directors, it could take between 8 to 10 weeks for processing. Please submit your reqs for processing often as the last day to submit reqs for this Academic Year is April 27, 2012. Reqs submitted after that date could take between 8 to 10 weeks to process. If you are an undergraduate student at UCLA you can apply to be part of the delegation! Each spring, the United States Student Association puts on the Grassroots Legislative Conference and National Student Lobby Day (LegCon). This four-day event provides students at every level of organizing and leadership ability the opportunity to learn new skills in student advocacy, network, lobby federal elected representatives on student issues, march through historic downtown Washington, DC, rally on Capitol Hill, and of course build lifelong friendships. COSTS: FREE FOR UCLA STUDENTS WHO GET ACCEPTED!! DEADLINE to apply: Sunday February 5, 2012 at 11:59pm! Bruin Lobby Corps is open to ALL students. No experience necessary. If you are interested in going on a lobby visit, attend one of our certification dates this quarter! The Green Initiative Fund Application deadline for Winter Quarter 2011 is Friday, January 27th, by 5pm. Please email final applications and direct all questions to TGIF@asucla.ucla.edu. Hearings will be held February 1st-3rd and February 8th-10th. The President's Office is now accepting applications for the Winter/Spring USAC Presidential Internship Program. Applications are due January 25th at 5pm. Feel free to e-mail us at usacprezinternship@gmail.com if you have any questions. The Second Annual UCLA Apartments Fair is on Wednesday, January 25th from 11 am to 5 pm, in Ackerman Grand Ballroom. Stop by in between classes to meet Westwood landlords, get information on properties, hear presentations on lease signing, and learn about student resources for living off-campus. If you are looking to transition from living in the dorms to living off-campus, if you are looking for some guidance on the Apartment search, lease-signing and apartment living, or if you just want to find an apartment for next year, the Apartments Fair is the perfect place for you! Landlords representing many Westwood properties, Student Legal Services, and UCPD will all be there to keep you informed and up to date about all things apartment related at UCLA. Brought to you by the USAC Internal Vice President's Office. Need a Little Funding for Sustainable Events? Check this Out…UCLA TGIF Sustainable Enhancement Mini Fund Application! The Green Initiative Mini Fund is available for sustainable projects requesting funds of $500 dollars or less. Application deadlines will be the first Friday of each academic month. The next deadline is Friday, February 3rd. Chairs the Election Board, and nominates and supervises members of the Election Board Executive Committee. Is responsible to USAC for the administration of all aspects of USAC elections. Extensive time commitment before and during regular Spring Election. The Chairperson will also oversee any Special Elections that occur during her/his tenure. The Chairperson is appointed by the USAC President for a one year term. If you are interested, please click on this link! Description: Strathmore Safe Rides is a late-night van service sponsored by the USAC IVP office which runs from 9pm until 2am on Thursday nights in order to ensure that you have a safe ride to and from all of your evening activities and festivities! All you need is your BruinCard for a safe and easy way home!! The van will begin on Hilgard and Manning at 9pm and will continue through the route for the rest of the night for Weeks 1-7. Thank you, have fun, and stay safe! Where: on campus- MS 5203. What: explore issues of campus climate, diversity, and inclusion at UCLA. This focus group will help shape the Museum of Tolerance's development of collegiate campus climate education and outreach. It is critical that the voices of UCLA students help to form their vision. Who: a diverse group of students from different backgrounds, identities, race/ethnicities, ages, sexual orientations, hometowns, economic status, religions, etc. to most accurately represent the voices and experiences of as many students as possible. Student Government Accounting will be closed for the Winter Holidays from December 19, 2011 – January 2, 2012. The University of California Student Association (UCSA) seeks a part-time Legislative Intern to learn a holistic view of a higher education non-profit, while supporting the coordination of lobbying and public testimony. The ideal candidate is self-motivated, able to think critically and possesses strong organizational skills. She/he will be committed to following through with job responsibilities and roles and will be able to manage multiple projects in a fast-paced environment. This position will be based in Sacramento, CA and will report to the Legislative Director. UCLA's first EVER Winter Quarter New Year's Celebration! A DJ Blacklight Dance Party! Free Gaming and Discounted Dining! Need a Little Funding for Sustainable Events? Check this Out…UCLA TGIF Sustainable Enhancement Mini Fund Application! The Green Initiative Mini Fund is available for sustainable projects requesting funds of $500 dollars or less. Application deadlines are the first Friday of each academic month. The next deadline is Friday, January 13th. Applications to be a Member (Alternate) on the Finance Committee have now been extended to January 10, 2012. Please send an email to the Chair, Ronald Arruejo, at usacficom@gmail.com with any questions. The USAC Financial Supports Commission is seeking to fill a Web Developer Internship position. Application here . In an effort to increase transparency and ease the application process, the USAC Academic Affairs Commission has moved our grant applications online. You can now apply to the Academic Success Referendum Fund and the Academic Affairs Mini-Fund through orgsync. The Academic Success Referendum Fund (ASRF) is a funding source available to UCLA students and registered student organizations that initiate programs to promote the academic success of UCLA students. The Academic Affairs Mini-Grants Program was created to supplement and enrich the education available to students at UCLA. Mini-Grant endorsed programs/projects must focus on raising and enriching student awareness of institutional matters and procedures, serving to further academic success at UCLA . The maximum allocation is $1000 per program and students may only apply once per academic year. Applications for both grants must be turned in at least two weeks prior to the date of the proposed program/project and an evaluation form must be completed no later than two weeks after the date of the proposed program/project. Applications to be an Alternate Member on the Finance Committee are now open. Please send an email to the Chair, Ronald Arruejo, at usacficom@gmail.com with any questions. Give the USAC President's Office feedback by participating in our Homecoming survey. The USAC Academic Affairs Commission and Random Acts of Kindness at UCLA are bringing all students the first ever Positivity Conference! The goal of the Positivity Conference is to welcome all Bruins for an afternoon of inspiration. All UCLA students have stresses and anxieties. In an effort to alleviate some of these concerns and to enrich students with positive outlooks, we have contacted four major speakers who will present us different perspectives on life by sharing their personal experiences and fields of study. Speakers will discuss topics such as sporting the right attitude, stress management, balancing work/school/relationships, leadership, personal development and self-empowerment. Our wonderful speakers include Ronnie Kovach, Walter Jackson, Chris Warner and Eva Nemeth. The conference will be held on Sunday, November 13 from 12-4 PM in the Ackerman Second Floor Lounge. Please take the time to gain perspective and join your peers for this lovely and enriching afternoon! Look forward to seeing you all at the conference! Contact maggiewalsh7@gmail.com with any questions/concerns. The USAC Academic Affairs Commission and Students in Free Enterprise invite you to come discover your path to social entrepreneurship at the official kickoff event for entrepreneurial academic opportunities at UCLA. Speakers include notable entrepreneurs like Dr. Bill Dorfman from ABC's Extreme Makeover, as well as a showcase of student founded ventures at UCLA. Learn about the exciting new 195 internship course being offered next quarter in which students will be partnering with nonprofit organizations, developing and implementing real business plans, and networking with accomplished businessmen and women. After attending the event, apply for the 195 internship. Email your resume to uclasife@gmail.com along with a statement of interest. Applications due Wednesday, November 23rd. For more info, check out our facebook event! Representatives from the College of Letters and Science and Academic Advancement Program (AAP) set aside time to have office hours with students in the Community Programs Office (CPO), housed in the Student Activities Center (SAC). This is a really great resource for students because it allows them to sit down with someone from these different departments to discuss academic issues and help facilitate goal-setting. In addition, these office hours are a great resource because students are now able to get the help that they need in a centralize place on campus, Student Activities Center, where many students go everyday to receive academic services, therefore, the USAC General Representative 3 office knew it would be necessary to include the Scholarship Resource Center. We organized this effort with the SRC and representatives from the CPO and now the program is up and running. If you need help with obtaining free money and figuring out financial issues, visit them during their office hours. Check out the Year-At-A-Glance Funding Calendar created by the IVP Office to help you stay on track with application deadlines! Unofficial USA Contingency Programming Allocations can now be viewed online. Please email the USAC Finance Committee Chair, Ronald Arruejo, at usacficom@gmail.com with any questions. All you need is your BruinCard for a safe and easy way home!! The van will begin on Hilgard and Manning at 9pm and will continue through the route for the rest of the night for Weeks 6, 7, 8, and 10. The Undergraduate Students Association (USA)/ Board of Directors (BOD) Programming Fund is available to all undergraduate registered student organizations for student programming. If your organization wants to host an event on campus during the winter quarter, the USA/BOD Programming Fund can help fund your organization’s event. You MUST meet with your Center for Student Programming (CSP) advisor at least 2 days PRIOR to the deadline; otherwise your CSP advisor will not approve your application. Be sure to follow instructions carefully, and be sure to INCLUDE ALL SUPPORTING DOCUMENTATION with your online application. The Green Initiative Fund Application deadline for Fall Quarter 2011 is Friday, October 28th, by 5pm. Please email final applications and direct all questions to TGIF@asucla.ucla.edu. Hearings will be held November 2nd-4th and November 9th-11th. Need a Little Funding for Sustainable Events? Check this Out…UCLA TGIF Sustainable Enhancement Mini Fund Application! The Green Initiative Mini Fund is available for sustainable projects requesting funds of $500 dollars or less. Application deadlines are the first Friday of each academic month. The next deadline is Friday, November 4th. Apply now! This presidential appointment is designated for a member of a community service organization, of registered campus organization (RCO) status, that is not affiliated with the Community Programs OfficeStudent Association (CPOSA) or the USAC Community Service Commission (CSC). This appointment would be a voting member of SREC and participate via both discussions and policy implementations regarding risk and liability, especially representing the independent (non-affiliated) community service groups. SREC allocates funds for the liability insurance and risk education efforts of student-run organizations. It also seeks to resolve matters concerning liability insurance coverage and risk management issues for registered campus organizations that engage in campus and community programs and activities. Please apply soon as the deadline is rolling. The deadline for the CS Mini Fund is this Friday October 21st, 2011. Please submit your application online by 5:00pm on 10/21/11. Also remember to talk to your CSP advisor at least 2 days in advance so she/he can sign off on your application when you submit it. Lastly remember to sign up for a hearing on Friday, 10/21 in front of KH322 for hearings next week that will be held on Wednesday, Thursday, or Friday (10/26-10/28). The USAC office of the Internal Vice President in conjunction with the Finance Committee and Student Government Accounting is proud to announce the addition of the Incentives Guidelines to the USA Financial Funding Guidelines. Under the USA Contingency Programming Fund, registered student organizations can now apply for emblematic items purchased from the ASUCLA Store to be used as incentives for their on campus programs and events. Note: A request for funding for incentives must include a statement of why these items are needed for the improvement and success of the program. Requests are limited to 2 items per program and the price limit per program is $100 total; all items and restrictions are subject to the discretion of the Finance Committee Chair. Application deadlines will be the first Friday of each academic month. The first deadline is Friday, October 7. The USAC office of the Internal Vice President in conjunction with the Finance Committee Chair, Student Government Services, and the Student Organizations Operational Fund are pleased to offer the UCLA Store SOOF Item List to student leaders as an easier and more effective way to purchase the items needed to operate their student group. With this tool the student leader is able to compose an estimate of the prices for each approved operational item in the UCLA store in order to create a proper purchase order. This tool can be found under the SOOF Guidelines and Application on the USAC Website. Student Government Accounting has created a Facebook page that has resources and information concerning Reqs, Purchase Orders, etc. Like ASUCLA SGA on Facebook and tell your friends and respective student groups about it as well. Reminders and other information will be posted as deadlines approach. GROW is the United States Student Association (USSA) Grassroots Organizing Weekend, a comprehensive three-day training for student leaders that teaches them how to be more strategic in their advocacy for issues on campus and in the community. Through a series of presentations, exercises, and discussions, you'll learn a set of skills and concepts for increasing the effectiveness of your student organizing. The Academic Affairs Commission is working closely with USIE, a program that gives students (junior or senior standing) a wonderful and unique experience to create and facilitate their own classes! If selected, students will take a pedagogy course in their winter quarter and will be able to gain units from it. We are looking for creative and fun, yet educational course ideas so be innovative with what topic you want to facilitate about. Applications are ONLINE on our website (www.usie.ucla.edu) and are due on October 31st at 5pm. THE USA/BOD PROGRAMMING FUND IS NOW AVAILABLE! You MUST meet with your Center for Student Programming (CSP) adviser at least 2 days PRIOR to the deadline; otherwise your CSP adviser will not approve your application. Be sure to follow instructions carefully, and be sure to INCLUDE ALL SUPPORTING DOCUMENTATION with your online application. Miss Covel Writing Tutoring? Now you don't have to! The USAC Academic Affairs Commission is pleased to announce the opening of the Student Writing Center (SWC), which will replace Covel Academics in the Commons Composition and ESL Lab. The SWC offers UCLA undergraduates one-on-one appointments on their writing. The Center is staffed by peer learning facilitators (PLFs), undergraduates who are trained to help at any stage in the writing process and with writing assignments from across the curriculum. PLFs tailor appointments to the concerns of each writer. Tutoring also now offered online! Through a combination of reflection and action, the Student Activist Project of the USAC External Vice President’s Office will help guide young students toward understanding the roots of many social problems so that we as leaders can effectively bring about real long-term social change that will improve our daily lives and those of the larger communities. At the same time we will teach you the leadership skills needed to affect social change, and finally, allow you to put into practice what you have learned by participating in the USAC EVP Office, other social justice organizations, and thereby become a true student and community leader. Apply to win one of 125 textbook scholarships worth $200! Takes ONE MINUTE to apply! Need a Little Funding for Sustainable Events? Check this Out! UCLA TGIF Sustainable Enhancement Mini Fund Application! The Green Initiative Mini Fund is available for sustainable projects requesting funds of $500 dollars or less. Application deadlines will be the first Friday of each academic month. Refer to Application and Deadlines below for details. Together with the UCLA Career Center, the Financial Supports Commission (FSC) is hosting an on-campus jobs fair on September 28 from 11-2 in Ackerman Second Floor Lounge to connect students with various employers on campus. Major on-campus employers such as UCLA Recreation, Office of Residential Life, CPO, and ASUCLA will be in attendance providing information on job openings. The Work Study Office and the Financial Aid Office will also be in attendance to provide more information. Application for the 2011-2012 USAC Internal Vice President's Office Fellowship Program. The Internal Vice President's Office is now accepting applications for the 2011-2012 USAC Internal Vice President's Office Fellowship Program. Applications are due September 30th. Email usaivp@asucla.ucla.edu if you have any questions. The President's Office is now accepting applications for the 2011-2012 USAC Presidential Internship Program. Applications are due September 19th. Feel free to e-mail us at usacprezinternship@gmail.com if you have any questions. Contingency Capital Items Fund is closed. It will be open beginning in Winter 2012 Quarter. Please notice the updated deadline and application for the Contingency Programming Fund. If you want to be a part of the USAC Finance Committee, please complete and turn in an application by September 15, 2011. Need funding to attend a conference for yourself or your student organization? The EVP Travel Grant can fund up to $550 in expenses for your trip. Applications are accepted on a rolling basis throughout the school year! Get ready for rides, games, entertainment, philanthropy, a rally, and endless fun!! Learn more about the UCLA Homecoming Festival and the UCLA Homecoming Game vs. Cal on October 28th and 29th on our website. The Student Organizations Operational Fund (SOOF) Fall Deadline is approaching. Applications for the Fall are due on September 16, 2011, at 5pm. The CAC Regular and Supplemental applications are due on August 18, 2011, at 4pm. The last day to submit Summer Contingency applications is Monday, July 18, 2011. Every year, the Office of the External Vice President takes a UCLA delegation to the summer congress of the University of California Student Association (UCSA), the statewide coalition of UCs and student governments. Summer Congress allows students the opportunity to meet students across the state and make their voices heard about issues that they feel should be prioritized within the organization for the upcoming school year. Students will also get a chance to attend workshops that build leadership skills and learn more about issues that are directly affecting students and higher education. More importantly, it is a chance for students to familiarize themselves with the statewide student movement, how they as individuals can get involved, and then bring what they learn back to the UCLA campus! If that's not enough... transportation & housing is covered for you by the EVP Office! Applications are accepted on a rolling basis until July 31. If you have any questions, please email usaevp@gmail.com. Thank you for your interest! Looking to play a crucial part in your school government? USAC staff applications for 2011-12 are now online. View the applications and deadlines at the link below. 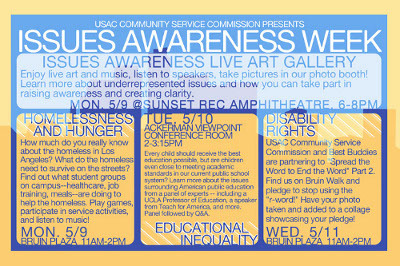 USAC Community Service Commission presents its first ever Issues Awareness Week! Learn about hunger and homelessness, educational inequality in the US, and disability rights via Live Art, a Speakers Panel, and our "Spread the word to end the word!" campaign. The AAC Post-Grad Scholarship Application is now available on the Applications page and linked below. The deadline for applications is Friday, MAY 20TH at 5pm. Please vote for your USAC representatives now on MyUCLA. This is the LAST week to turn in Contingency Programming and Capital Contingency applications to the USAC Finance Committee. All applications are due this Wednesday, May 4, by 5 pm. This is for all events until the end of the 2010-2011 Fiscal Year. Please email the Chair at usacficom@gmail.com with any questions or concerns. The 2011 Candidate Application Packet, Endorsement Application, Election Walk Map, Proxy Forms, and announcements are now available on their own page. See the link below. DEADLINE for ALL REQS is April 29, 2011. Reqs submitted after the deadline will take between 8-10 WEEKS for processing. The Community Service Commission has released the 3rd issue of its Service Speaks Newsletter. Follow the link below to view. UCLA students! 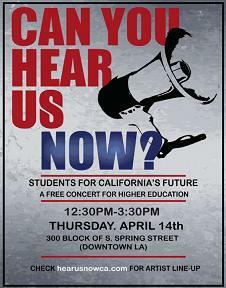 Can You Hear Us Now is Thursday, April 14th, 2011 from 12:30am-3pm in Downtown Los Angeles! BUSES LOAD FROM UCLA AT 11AM! We will unite with other UC campuses, CSUs and community colleges to make our voice heard to California legislators about the importance of prioritizing higher education!! Come out to demand that tax extensions be placed on the November ballot, call for the passage of the California DREAM ACT, and gain support for new revenues in the state!!! Please look at the updated deadlines and applications for the USA Contingency Capital Items and USA Contingency Programming Funds which can be found at http://www.usac.ucla.edu/funding/programming.php. Email the Finance Committee Chair at usacficom@gmail.com if you have any questions. What: Organization Space Allocation Applications for Office/Locker/Mailbox Space in Kerckhoff Hall are DUE! When: TODAY (Thursday, April 7th Week 2) @ 5pm (late submissions are NOT ACCEPTED)! Student organizations that currently have office/locker/mailbox space must REAPPLY! Hearing schedules will be released by Friday, April 8th via OrgSync. All hearings will be conducted throughout Week 3. Represent UC Students Systemwide with UCSA Appointments! As the official voice of the UC students, UCSA nominates students to sit on UC system-wide committees. These committees deal with critical policy issues that affect every student in the UC system (e.g. admissions policy, budget prioritization, and technology investments). It is vital that UC students have strong representatives on these committees. The EVP Travel and Advocacy Grant Applications are now closed. Free t-shirts, refreshments, giveaways (including Clippers Tickets!!) & performances! Candidate Application Packets are going green! If you are interested in running for a USAC officer position please download the packet below or on the Applications page. USAC passed two new resolutions this Tuesday. The first is a 'Resolution to Improve Intergroup Understanding and Dynamics on the UCLA Campus' and the second is a 'Resolution to Support the Continuation of Covel Peer Learning Labs'. To read the resolutions as well as others passed by the council, see the link below. The 2011 Office Space/ Locker Space/ Mailbox Application is due THURSDAY APRIL 7 at 5 P.M. The application must be submitted in both paper and electronic format. The paper application should be submitted to the USA President's Office at Rm. 317 Kerkhoff Hall. Remember to include the appropriate supporting documents with your application. The electronic application must be e-mailed to osac@asucla.ucla.edu. The hearing schedule for office space allocation will be released on the Friday following the deadline ( April 8). Additionally, for those of you who missed the OSAC Town Hall on March 10th regarding the expectations of the committee, the full presentation has been posted on OrgSync. It can be accessed by clicking on the "Files" tab on the left side of the OSAC profile. Finally, the committee will be performing Locker/Mailbox audits this Friday (April 1st) between 1:00 and 2:00 P.M. If you have any further questions please feel free to contact the committee at osac@asucla.ucla.edu. Learn about what the USAC Financial Supports Commission is doing for you! See the link below for more information. 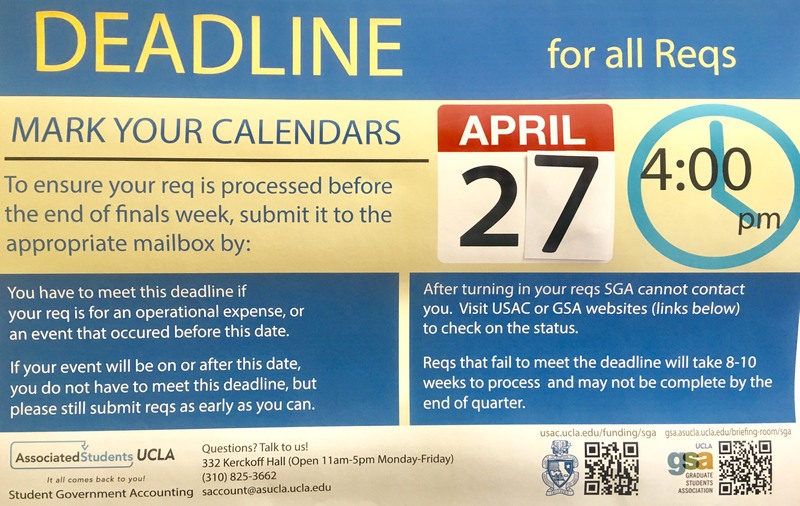 General Requisitions submitted to Student Government Accounting (SGA) after the April 29, 2011 DEADLINE could take between 8-10 weeks for process. SGA's Customer Service hours are Monday - Friday from 12:00 Noon - 5:00pm. Don't delay, submit your reqs everyday! Congratulations to the Winners of the USAC Community Service Scholarship! See if you're a winner in the document below! The Office Space Allocation Committee 2011 is Hosting a Town Hall THIS WEEK! Submit both an electronic copy to osac@asucla.ucla.edu as well as turn in a paper copy to the USA President's office at 317 Kerckhoff Hall. The Undergraduate Student Association Council passed two resolutions Tuesday, one in support of worker's rights-verified apparel being sold at the UCLA Store, and the other in support of the CA DREAM Act. Spring 2011 FSC Textbook Scholarship! The textbook scholarship application for Spring 2011 is up! Apply now! The Office Space Allocation Committee (OSAC) is releasing their Office/Locker/Mailbox Space Application on THURSDAY, MARCH 3rd (Week 9) via OrgSync! Add 'Office Space Allocation Committee (OSAC)' on OrgSync to download the application. Adding OSAC to your OrgSync account will allow you to directly receive important dates, information, deadlines, and notifications regarding the allocation process from the committee. Add UCLA Office Space Allocation Committee to your or your organization's Facebook account to receive additional updates. Check the Organization Space Allocation Guidelines to see if you qualify for Office/Locker/Mailbox Space. Applications will be DUE on THURSDAY, APRIL 7th @5pm during Week 2 of Spring quarter. This year is a reallocation year for OSAC, so student organizations that currently have offices, lockers, and/or mailboxes in Kerckhoff Hall also need to REAPPLY. Additionally, the committee will have an OSAC Town Hall on THURSDAY, MARCH 10th (Week 10) from 2-4pm in the Ackerman (A-Level) Viewpoint Conference Rooms. The Town Hall will breakdown the application and answer any questions or concerns regarding the allocation process. It is strongly recommended that someone from your organization attends this event. If you have any questions feel free to contact the committee at osac@asucla.ucla.edu. Academic Affairs Commission Presents Ethnic Studies Symposium! A symposium on the state of Ethnic Studies Now! at UCLA and Beyond will be held on Monday, March 7, 2011. This event seeks to make links between national and local actions that have targeted Ethnic Studies including: HB 2281/Anti-Ethnic Studies legislation in Arizona, the impending termination of Asian American Studies Department at Cal State LA, and the suspension of American Studies and the dismantling of Community Studies Department at UCSC. USAC Gen Rep #2, Campus Events Commission, and The Den Presents the Last Basketball Campout of the Year. The second issue of the Community Service Commission Newsletter is now available! Click the link below to download! USAC Community Service Commission invites you to join us for our Non-profit Networking Night on Thursday, February 24 to meet professionals from the non-profit sector! Over dinner, students will be able to learn more about the ins and outs of the industry and find out how it is possible to do service as a career. This night will give students the chance to network with organizations who offer paid internships and opportunities after college such as Teach For America, CoachArt, Red Cross, City Year, Habitat for Humanity, A-26, TreePeople, The Giving Spirit, and more! Also, this night provides the platform for future collaborations among student leaders to further UCLA's visibility and involvement in the community. The February 2011 USAC Newsletter is now available. Please view or download it below! Learn about scholarships, loan opportunities and help with filing tax returns. Tuesday, Feb. 15th Kerckhoff Grand Salon from 12 - 3 p.m.
USAC Community Service Commission presents Alternative Spring Break 2011. Do service through a one-week immersion program and learn about social issues while taking the chance to step out of the LA bubble and find a rewarding experience in helping those in need. Applications are due Feb. 11! Does your student group need funding for a health-related program or event? Apply today for the Student Welfare Programming Fund! The Green Initiative Fund Application deadline for Winter Quarter 2011 is Friday, January 28th, by 5pm. Please email final applications and direct all questions to TGIF@asucla.ucla.edu. Confused about applying to medical school? Not sure where to start and need help preparing for the MCAT or writing your personal statement? Want to be entered into a drawing for a FREE preparation course? The Financial Supports Committee is hosting a FREE 3-part MCAT workshop series for students who are interested in applying to medical school. There will be one free hour of instruction on the MCAT by a qualified instructor. In addition, there will be student speakers who have recently and successfully applied to med school to help answer any questions about the application process. Come out, learn about the mCAT, and eat FREE FAT SALS! From 6:00pm - 7:00pm in Boelter 5440. This scholarship was designed to support students who despite significant financial need still give back to our communities. At least 60 students will receive a one-time $1,000 scholarship to be used towards their tuition/other school expenses. It's a VERY simple application, due Friday, February 18th. Application in the link below. CS Mini Fund Winter Quarter Deadline is January 28th by 5pm. Please sign up for a hearing on Monday, January 31, 2010 at the Student Government Accounting office on the 3rd Floor of Kerckhoff Hall 332 between 8am - 5pm. Remember to bring supporting documents to your respective hearing. Get Priority Hearing Sign-Ups! Please join us on January 24th at 5pm in Kerckhoff Hall 417. You will learn everything you need to know about CS Mini Fund Applications. Please visit: students.asucla.ucla.edu/funding/sgahandbook/stipends.php for important information and stipulations regarding is process. REQUIREMENTS: the employee must provide either their PASSPORT or their State issued ID along with their Social Security Card when submitting these documents to the Student Government Accounting office. The commissioner or president of each student group will also have to submit a list of employees with the stipend amounts to Irma Tirado and a budget transfer moving funds from the Fall Operational Account (6001) into the Assistance account (5001). Interested in lobbying your state elected representatives on the CA budget and the CA DREAM Act? Apply to the University of California Students Association's annual Student Lobby Conference in Sacramento, CA. The UC Student Lobby Conference (SLC) brings UC students together to lobby at the State Capitol on legislation related to higher education issues (This year: DREAM Act and California State Budget). SLC provides opportunities to build member lobbying skills, refine student testimonials, and directly engage elected officials to support higher education. See the link below for more information. The DEADLINE to apply is Friday January, 28 2011! 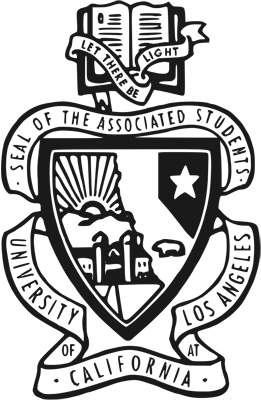 The USAC Internal Vice President's office presents the Student Group Resource Manual. A How-To guide for funding. See the download link below! CS Mini Fund Winter Quarter Deadline is January 28th by 5pm. Please sign up for a hearing on Monday, January 31, 2010 at the Student Government Accounting office on the 3rd Floor of Kerckhoff Hall 332 between 8am - 5pm. Remember to bring supporting documents to your respective hearing. If you need to sign up for a BOD Hearing and are not shared on the Google Document, please contact the Budget Review Director for access. Need a textbook for the coming quarter and don't want to pay? Check out the USAC Financial Supports Commission's Textbook Loan Library! See link for more details and a listing of available books. Student Stories is a project created by the 2010-2011 USAC General Representative 1 CommUNITY team to understand why students do the things they do. It focuses on seeing how a student's past or identity influences how the ideas and actions that they have now. Before you can share other people's stories, you should be able to share part of your own, and with our first Student Stories video, we aim to showcase why we believe the initiatives of the CommUNITY Team is important in the first place. Reminder that the DEADLINE for Second SOOF Funding is January 10th, 2011. Please apply before this date via the Operational Funding Page or the Online Application below. Welcome back to UCLA for Winter Quarter 2011! Bookmark this page for updates on what your Undergraduate Student Government is up to in the coming quarter! The deadline to submit General Requisitions for Fall Quarter expenses is December 17th. Reminder: Submit your completed reqs between now and April, please allow 2 weeks for processing. Reqs submitted between April and May, please allow 8 weeks for processing. Sign up now for 250$ towards your textbooks for next quarter! The USAC Financial Supports Commission is giving out $15,000 in scholarship money and applying is easy and incredibly simple. Come and find out how to get money for your student organization! The USAC Finance Committee currently has $43,363.45 to allocate from its Contingency Fund, and UCLA Student Groups should utilize this workshop to learn how to maximize their financial request returns. Have a question about USAC? Looking for information about what your student government is working on or how to get involved? Have a suggestion or idea on how USAC can make your UCLA experience better? *Learn about the services, events, and advocacy campaigns all 13 USAC Offices are working on. *Let us know what issues are most pressing to you so USAC can work to address them. *Meet the 13 students you elected to represent you this year! WHEN: Every Tuesday and Wednesday from 11am-3 pm. The Ask USAC Table is brought to you by the USAC General Representative 1 Office. Submit your completed reqs between now and April, please allow 2 weeks for process; reqs submitted between April and May, please allow 8 weeks for processing. USAC Internship Application for Winter 2011 is now available. See the application below for more information. December 17, 2010 is the DEADLINE to submit your general requisitions for Fall Quarter expenses. Also, the Student Government Accounting office will be closed from December 20, 2010 - January 31, 2010 due the campus wide Winter Break and campus closure. Sign-ups for the upcoming BOD fund hearings on November 17th, 2010 from 6-9pm and November 18th, 2010 from 7-10pm are being done via Google Docs. The 'edit' link is at the bottom-left of the spreadsheet. Make your mark on our community at Community Service Day on Saturday, November 20th! Follow the link below for more information and to register. Please visit the website below to see more about how we are doing our best to stop the coming fee increases. Winter Deadline is approaching! Applications are due November 12th, 2010 by 5pm. Sign-ups for Winter hearings will be November 12th via Google Docs. Time: Friday, 10/22/2010 from 11-2 p.m. The Fall quarter deadline for the CS Mini Fund application is October 22nd at 5pm. See the online application below. For more information, see the posted guidlines here (DOC). We apologize for cancellation of The SOOF Mandatory Meeting. It has been re-scheduled for Wednesday, October 13th at 12pm in Kerckhoff Grand Salon. Thank you for your flexibility and if you have any questions please contact the Budget Review Director at budgetreview@gmail.com. Check out The Wooden for information about John Wooden's 100th Birthday Celebration being held October 14th. See the new 'Paid for by USAC' logo for use on posters and other items on the Logos Page. Feel free to use either these or the older style. 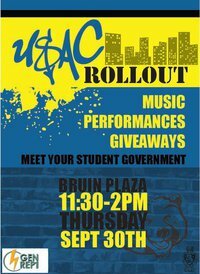 Check Us Out in Bruin Plaza this Thursday! - Music, Giveaways, & More! The Fall BOD Application deadline has been extended until October 8th. Sign-ups for Fall hearings will be October 11th in Student Government Accounting Office KH 332. Winter USA/BOD Programming Deadline is November 12th, 2010 by 5pm. Sign-ups for Winter hearings will be November 15th in Student Government Accounting Office KH 332. The Spring 2010 Application was the correct application for this term. Apologies for any confusion. See the application below. USAC Internship Application here! For incoming/continuing students interested in getting involved in the work of the USA. First Deadline - September 20th. Apply to win $250 for textbooks from USAC Financial Supports Commission by September 23rd at 5pm! Please see the new Travel Grant Application below and the Misc. Funding page for new Travel Grant Guidelines. USAC officers support the American Indian Student Association's Demand for the Reinstatement of the American Indian Studies Student Affairs Officer. See the Resolution below. Welcome to the redesigned home of the UCLA Undergraduate Students Association! Please send any comments or problems to the Webmaster. See it here or on the Operational Funding page. Your Student Group Need Support? See the Center for Student Programming Workshop Schedule below! SOOF hearing Sign-ups at the Student Government Accounting Office on Wednesday, September 1, 2010. Remember to bring supporting documents to your respective hearing. Please see the new Contingency Programming Application here or below. For information, please check the updated SOOF Budget Assumptions & Instructions as well as the updated SOOF Guidelines. Please take this brief survey on how well USAC is meeting your expectations! The new 2010-2011 SOOF Workshop powerpoint is now available! Check it out if you are seeking SOOF Funds for the upcoming year. Remember that the deadline to apply is August 31st, 2010. The Graduate Students Association at UCLA supports the DREAM Act with USAC. See their statement here and our (USAC) statement below. Staff Members: applications accepted on a rolling basis. For Funding information please check out the new Student Government Accounting FAQ page. See the updated version of the application. Social Justice Co-Director: Due July 28th, 2010. Presidential Appointed Positions still available! There still are some Presidential Appointed Positions available! Check out this updated list and apply now. - Updated June 2010. USA Summer Contingency is now available until July 12, 2010. Yesterday, when we received the news of Coach Wooden�s passing, I stood alongside thousands of deeply saddened students, staff and faculty. I want to speak on behalf of the UCLA undergraduate community as I send thoughts and prayers to the Wooden family. Coach Wooden will truly be missed. Not only did Coach Wooden serve as a basketball legend, but also his words of wisdom and remarkable life truly are a source of inspiration for Bruins and sports fans across the country. Alongside the Undergraduate Student Association Council, I want to acknowledge and honor the life of this great leader who meant so much to us all. For over six decades, John Wooden has been a vital part of the UCLA family, reminding us all, �success comes from knowing that you did your best to become the best that you are capable of becoming.� Being an example of excellence, Coach Wooden truly led a successful life. Not only did the Coach never have a losing season in the 29 years of his career as a head coach, but also to his family and friends, he has succeeded as a father, grandfather, friend and mentor. As a student leader, I personally have been touched by his commitment to this campus, his life of integrity, and his famous seven-point creed. The same kind of diligence, perseverance, and discipline he taught on the basketball courts was imparted onto many of us in the classroom and as we go out into the community. It is extremely hard to find another individual who has made such an impact on the spirit of the UCLA campus. Few others have the respect of so many, evident as thousands of people across this country immediately sent their concerns and best wishes as Coach Wooden experienced medical difficulty. Only moments after his passing had been announced, an informal vigil of close to 200 students formed outside the Ronald Reagan Medical Center. I encourage all of us to keep the Coach in our thoughts, recalling his wisdom and great contribution to the world. Losing such a legend is painful to us all and we must mourn this loss alongside the Wooden family, supporting one another. Finally, it is important that we continuously acknowledge what a great impact Coach Wooden has had on us as athletes, students, and as Bruins. 2010-2011 Staff Applications now available. Just added: AAC, due June 2nd, 2010! General Representative #1 - Deadline: May 27th, 2010. General Representative #3 - Deadline: May 26th, 2010. Academic Affairs Commission - Deadline: June 2nd, 2010. Community Service Commission - Deadline: May 28th, 2010. Facilities Commission - Deadline: May 25th, 2010. Financial Supports Commission - Deadline: May 28th, 2010. Apply now! President's Staff & Appointment Applications Available! Interested in working in a USAC office on issues of affordability, campus safety, or bringing students together? Want to be apart of decision making on this campus? The President's Office is looking for its next staff as well as individuals to be appointed to over 20 different committees around UCLA. The Mini-Grants Program was created to supplement and enrich the education available to students at UCLA. Mini-Grant endorsed programs/projects must focus on raising and enriching student awareness of institutional matters and procedures, serving to further academic success at UCLA . Applications must be turned in at least two weeks prior to the date of the proposed program/project and an evaluation form must be completed no later than two weeks after the date of the proposed program/project. Workshop will be held on Thursday, April 15th at 6pm in Ackerman Union 2410. Priority Hearing Sign-ups for groups that attend. CS Mini Fund applications are due Friday, April 23rd at 5pm. Be sure to submit your application and meet with your CSP advisor no later than Wednesday, April 21st to ensure that your application will be completed and approved on time. General Requisition deadline approaching, May 28, 2010! The deadline to submit your general requisitions for expenditures for this fiscal year (August 1, 2009 - May 31, 2010) is May 28, 2010 by 5:00pm. April 30, 2010 is the Spring Quarter DEADLINE for New Hire Packets for SGOF and SOOF. 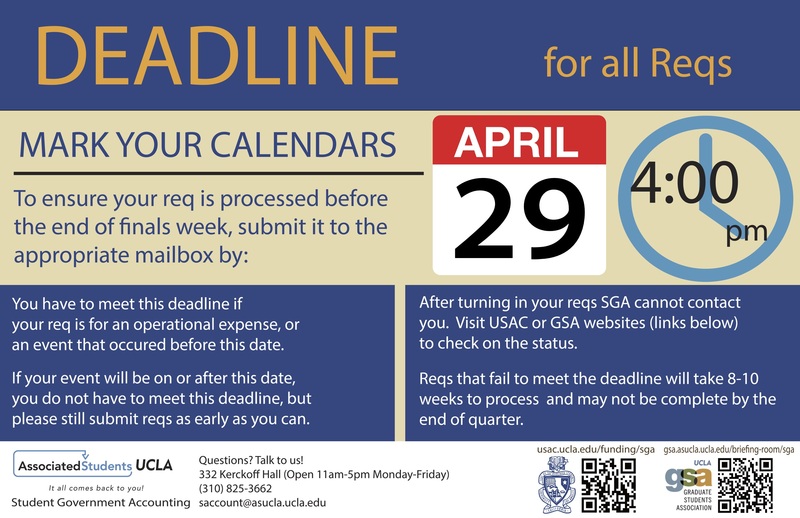 Please visit: students.asucla.ucla.edu/funding/sgahandbook/stipends.php for important information and stipulations regarding this process. The employee must provide either their PASSPORT or State-issued ID along with their Social Security Card when submitting these documents to the Student Government Accounting office. The commissioner or president of each student group will also have to submit a list of employees with the stipend amounts to Irma Tirado (itirado@asucla.ucla.edu) and a budget transfer moving funds from the Fall Operational Account (6001) into the Assistance account (5001). Check it out at usac.ucla.edu/tgif. Spring USA/BOD Programming Deadline is 2/26/10 by 5:00pm. All student groups must meet with their CSP Advisor 2 days prior to the deadline. If this is not done, your application will not be approved by your CSP Advisor. Winter TGIF funding deadline is Friday, March 5, 2010 by 5pm. Workshop will be held on Monday, January 25th at 7pm in Kerckhoff Hall 131. Priority Hearing Sign-ups for groups that attend. With rising tuition costs, increasing budget cuts, and the financial burden of student loans, the USAC Financial Supports Commission will be awarding UCLA Undergraduates in financial need with $250 Textbook Scholarships redeemable at the UCLA Store. Take advantage of this great opportunity by completing the application at the link below. CS Mini Fund applications are due Friday, January 29th at 5pm. Be sure to submit your application and meet with your CSP advisor no later than Wednesday, January 27th to ensure that your application will be completed and approved on time. February 5th, 2010 is the Winter Quarter DEADLINE for New Hire Packets for SGOF and SOOF. Please visit: students.asucla.ucla.edu/funding/sgahandbook/stipends.php for important information and stipulations regarding is process. REQUIREMENTS: the employee must provide either their PASSPORT or their State issued ID along with their Social Security Card when submitting these documents to the Student Government Accounting office. The commissioner or president of each student group will also have to submit a list of employees with the stipend amounts to Irma Tirado (itirado@asucla.ucla.edu) and a budget transfer students.asucla.ucla.edu/funding/sga/budget_transfer.pdf moving funds from the Fall Operational Account (6001) into the Assistance account (5001). 2nd SOOF Deadline on FRIDAY, January 8th, 2010, 5pm. Get them in on time! TGIF Application due on Tuesday, November 24th, 5pm. The Fall funding deadline for TGIF Applications is Tuesday, November 24th by 5pm. Hearings will be held during weeks 1 and 2 of winter quarter. The TGIF Winter funding deadline is Friday, March 5, 2010 by 5pm. Hearings will be held during weeks 1 and 2 of spring quarter. Please contact TGIF@asucla.ucla.edu if you are interested in applying for funding. CS Mini Fund Hearings will take place on Thursday, October 29th from 8-11pm in AU 2408 and Friday, October 30th from 3-6pm in KH 417. Sign up for a hearing Friday, October 23rd at 9am - Monday, October 26th by 5pm at the Student Government Accounting Office in Kerckhoff Hall 332. Fund Allocation Meeting will be held Monday, November 2nd in KH 417 at 12pm. 2009-2010 EVP Advocacy Grant and Travel Grant Applications are now available. Applications for Assistant Budget Review Director due this Friday, October 16, 2009! Please turn into Kerchoff 300B by 5pm. 2009-2010 Staff applications available now! Application for 2009-2010 Presidential Appointed Positions available! Deadline for submission is Thursday, May 28th. 2008-2009 TGIF Funding Allocations Available! The academic year-end deadline for Contingency Fund applications is May 18, 2009 at 5:00pm. Summer Contingency opens June 1, 2009 through July 13, 2009 for expenditures between June 1-July 31, 2009.. The deadline to submit your general requisitions for expenditures for this fiscal year (August 1, 2008 - May 31, 2009) is May 29, 2009 by 5:00pm. 2009 Office Space Allocation Application is ready for download! OSAC Townhall Meeting will be on Monday, April 13, 2009 @ 2-4pm in the Ackerman Viewpoint Lounge. Applications are due at 5:00pm on Friday, April 17, 2009. 2008-2009 CS Mini-Fund Digital Application is now available! Applications will be due May 1st, 5pm. The Green Initiative Fund (TGIF) Grant Application is available! Application is due April 3rd! Are you or someone you know in dire need of student housing? For assistance, we urge you to please contact usacprez@gmail.com. 2009 Election Board Appointment Application is now available for download! Cultural Affairs Programming Fund is closed until Spring Quarter due to lack of funds. Opening in the Student Advisory Committee! Student Fee Advisory Committee has an opening for 1 undergrad to serve until the end of this school year. Please fill out a Presidential Appointments Application and email it to usacprez@gmail.com ASAP! The President's office has an internship for transfers and first years interested in getting involved in the UCLA student government. Please apply and turn in the application in Kerckhoff 317 or email at usacprez@gmail.com. Welcome to the new USAC website! USAC Presidential Appointments are still available.